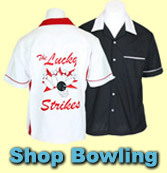 Daddy-O's - Retro Bowling Style Shirts And Vintage Inspired Dresses. 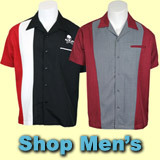 Your one stop shop for rockabilly & swing clothes, bowling shirts, and vintage inspired clothing! gift for that hepcat or kitten on your shopping list. wear, bowling shirts and 50's retro vintage inspired clothing. Steady Clothing, Stop Staring, Scully, Lucky 13 and many others. Do not hesitate to call or e-mail us with any questions or concerns! are Copyright 1996-2018 Daddy-O's Clothing, Inc. Unauthorized duplication is strictly forbidden.